Of course the health and well being of Loretta Lynn is the most pressing concern for fans. But the continued health issues for the 85-year-old have also resulted in continued delays in the release of her latest record, Wouldn’t It Be Great. Fans may have to wait a little longer than anticipated for the release as Loretta continues to recover from health concerns. Loretta has been slowly recovering from the health episode ever since, making her first appearance in public on October 1st, 2017 at the Tennessee Motorcycle and Music Revival that took place on Loretta’s Hurricane Mills ranch in Tennessee. She also made a public appearance at the Hall of Fame induction ceremony for Alan Jackson on October 22nd. But then on January 8th, fans of country music legend were notified that Loretta Lynn had suffered another health setback after falling and fracturing her hip. The information was first revealed by her sister Crystal Gayle in an Instagram post, and later confirmed by the Loretta Lynn camp. “I was with Loretta yesterday. She is in good spirits and is doing as well as can be expected with this type of injury,” Crystal Gayle told followers. 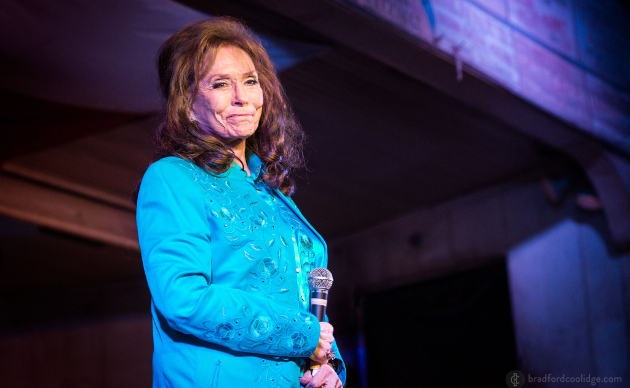 Then on January 31st, Loretta Lynn canceled her only tour date in 2018 at the Hard Rock Hotel & Casino in Tulsa, Oklahoma. “Due to circumstances beyond our control, the Loretta Lynn date, scheduled May 17, 2018, in Tulsa has been canceled,” Lynn’s manager said. This continues to leave the release of her pending album Wouldn’t It Be Great up in the air. The album was recorded primarily at the Cash Cabin Studios in Hendersonville, TN, with producer (and Lynn’s daughter) Patsy Lynn Russell, and caretaker of the Cash Cabin Studios, John Carter Cash. Loretta is said to have recorded upwards of 90 songs at the Cash Cabin over the last few years in preparation of regular releases from Sony Legacy. Loretta Lynn’s previous album Full Circle from 2016 received a Grammy nomination, and her 2004 record Van Lear Rose with producer Jack White was a Grammy winner. On August 25th of 2017, the Country Music Hall of Fame unveiled a special Loretta Lynn exhibit to help commemorate the museum’s 50th Anniversary. The last news out of the Loretta Lynn camp was over a month ago. Hopefully Loretta Lynn is on the mend, and will be able to make some public appearances in 2018 to help promote Wouldn’t It Be Great. But until then, fans should be patient for the anticipated record until Loretta is healthy enough to unveil it on her terms. One of the great ladies of Country Music – wishing her well. Love Loretta and praying for her full recovery. Don’t see why though the album can’t be released this year even if she’s not able to fully promote it – might do her a world of good to see the record high on the charts (as it undoubtably will be as her last two albums both went top 10 and top 40 all-albums Hot 200) , plus hasn’t she supposedly recorded nearly a hundred songs in the last half decade with Patsy and John Carter Cash – there’s plenty of stuff in the can for her next album that she can promote. The fans know Loretta is in her eighties and don’t expect her to have the stamina of a young girl – it would be fine with me if she simply appeared on shows to promote it and not sing live – or even just do call in interviews as Doris Day did with her album several years ago. Doesn’t matter. She’s still signed to a major label and as long as that’s the case, she’s going to go through an outdated model of promotion, age be damned. I agree. How much of the promotion circuit was she ever really going to go through anyways. This way she’d now her fans still love her! Loretta knows we her fans love her anyway.That’s a given. We love you, an your always gonna be one of the best out there can’t no other woman do like Loretta can our prayers an get better wishes are going up to the man that can.. Take care an we luv you always…. Loretta will forever be my number 1 favorite singer.That’s a given.Nothing or no one will ever change that! God’s Blessings to you Loretta for a full recovery. Although we all love you and would love to hear you sing, we want you to Take your time, do what you need to get better, put yourself first. We, Your fans, will always be here for you. My name is Priscilla from California. I wish they’d release the album now. Love you Loretta, hope your health will improve soon there is nobody like Loretta. Prayers for you. Loretta Lynns music stands for itself (& stands the test of time). I hope the new album will be released soon & Loretta Lynn will be back on track. When I talked to folks at Hurricane Mills last September, they said she was living somewhere closer to Nashville to be closer to her daughters. I saw her exhibit at the CMHOF on the same trip. Here’s hoping for the best for one of the best of all time. 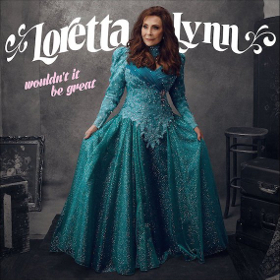 Enjoy this exclusive preview from Loretta Lynn’s “Wouldn’t It Be Great” album courtesy of Loretta Lynn Fan Website! Your #1 source for ALL things LORETTA with almost 80,000 fans worldwide!